Here we have that happy partnership of a new trolley and a new home. 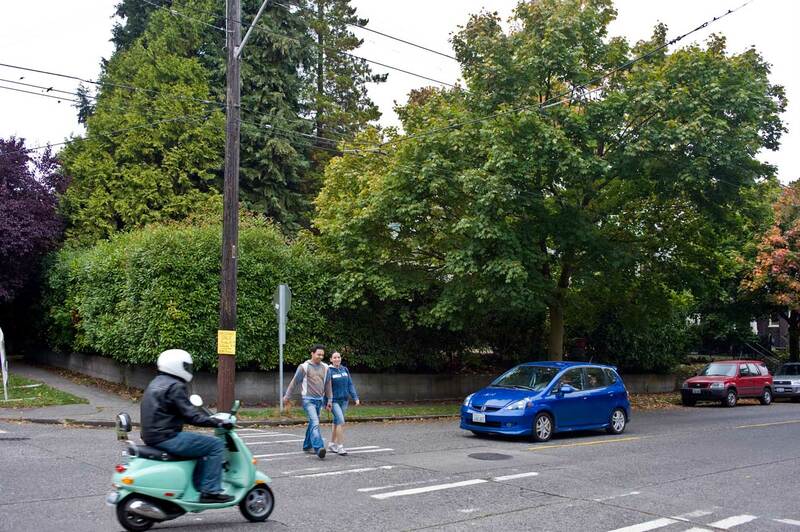 And the streets — Aloha on the left and 15th Avenue on the right — are paved. This is a very early offering of the Webster and Stevens studio (through many of its earliest years the studio was the principal provider of editorial photography for The Seattle Times). The historical negative from which the print was cast is signed and numbered “135 W&S.” This negative is so early that it did not make it to the Museum of History & Industry, where the bulk of the studio’s work — more than 40,000 negatives — is protected and shared. Rather, this print is kept in the much smaller “Metro Collection” at the Washington State Archive. A note on the back of the photograph reads, “James P. Henry motorman taken about 1897.” Hedging on the date was wise because Capitol Hill trolley car No. 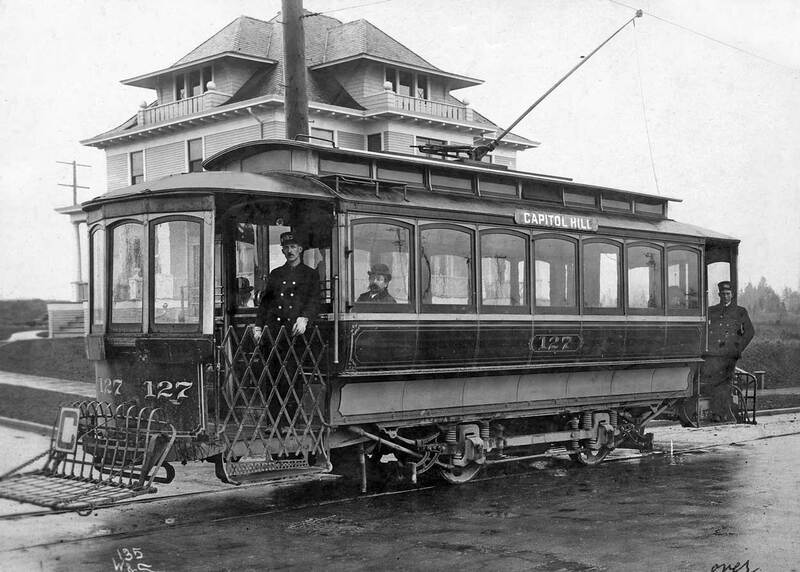 127 was not delivered to Seattle until 1902. A more likely date is 1903 when another W&S photo of the home, sans trolley, is featured in a spring issue of the Seattle Mail and Herald with several other homes as examples of residences built in the then new Capitol Hill addition. The weekly tabloid identifies the home as belonging to Marcus M. Lyter, a lawyer. We may imagine, though we don’t know, that this is Lyter peering through the window of car No. 127. But Lyter, it seems, soon vanishes from the Seattle scene. And did his home disappear as well? If the reader visits the northwest corner of 15th and Aloha, as Jean Sherrard did recently, and peers through one of the few openings in the semi-evergreen landscape that stuffs the lot, the reader will discover the same home. THEN: Most likely in 1902 Marcus M. Lyter either built or bought his box-style home at the northwest corner of 15th Avenue and Aloha Street. Like many other Capitol Hill addition residences, Lyter's home was somewhat large for its lot. NOW: What Jean Sherrard found when he recently revisited the corner was . . . well, a lot of trees and shrubs. A copy of the trolley photo is also in the Seattle Municipal Archives collection, item 64767. If this link is active, it will take you there directly. The caption indicates the year was 1903.